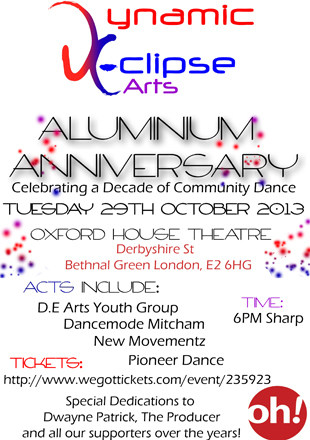 Ten years is a significant anniversary for most, and it is no different for community based dance company Dynamic Eclipse Arts (D.E Arts) as they celebrate a decade of teaching and performing whist still remaining humble enough to continue learning and developing themselves. “We Teach Dance and Continue to Grow as it Evolves around us. Dance isn’t just movement it’s Life, Love and the Future”. The show will have performances from Youth Companies connected to D.E Arts; Pioneer Dance, Dancemode Mitcham and D.E Arts' own youth group too. As well as a special collaboration with east London company New Movementz UK. And a special dedication to Dwayne Patrick The Producer. In 2003 a time where uniting contemporary dance and hip hop were looked down upon within the higher educational system, it was a moment where BA Hons artistic director Ayshen Icy Mustafa Abdullah along with fellow founders Melissa, Nicola and Shaleen formed the company while studying dance at Roehampton University. The company allowed them to dance, perform and teach in all styles they trained in, enabling them to Break Barriers and by not conforming, D.E Arts were able to express dance freely by dancing and teaching the True Fundamentals of their styles they worked hard at. The truth of movement is still of high importance to the company today. D.E Arts Youth Group recently performed at the Queen Elizabeth Olympic Park on the main stage as part of the National Paralympic Day featuring the Mayor of London’s Liberty Festival, to celebrate the first anniversary of the London 2012 Paralympic Games on Saturday 7th September. Elizabeth Olympic Park D.E. Arts have honed their depth of technique and skills from their Educational training with various companies such as Shift (The Place Youth Group), Union Youth (Union Dance Company), The Waacktitioners and Boy Blue Entertainment. Their wealth of dance experience comes from training with established and Ground Breaking Choreographers in the UK from a wide range of genres. The Honourable Kevin ‘Kaiser 22’ Lancelot Everiste Black Belt Tae Kwon Do Champion. And The Prominent Kenrick H2O Sandy from Laurence Olivier Award winning group Boy Blue Entertainment.